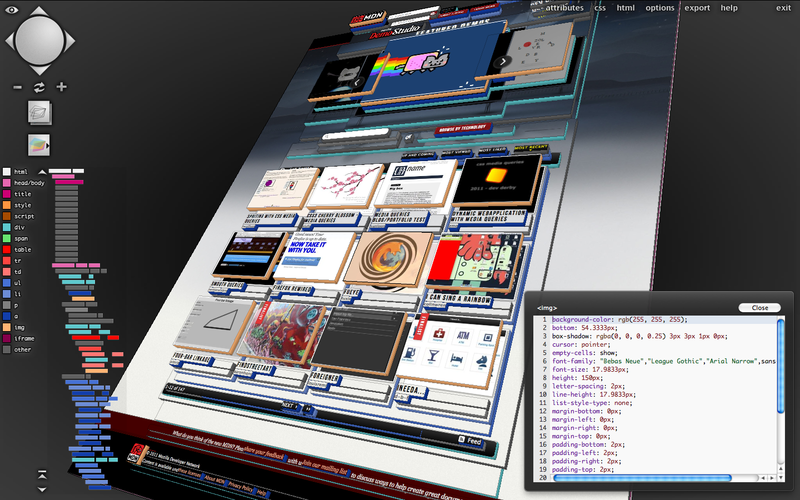 Tilt is a Firefox addon that lets you visualize any web page in 3D. A new update is available, coming with more developer-oriented features. Try the addon. Since the first alpha version of Tilt was announced (a Firefox extension focused on creating a 3D visualization of a webpage), a lot of work has been done to add a great number of developer-oriented features. These focus on debugging the structure of a webpage, inspecting styling and attributes for each node and seamlessly refreshing the visualization when the DOM structure changes or after contents of document are repainted. Tilt is useful when searching problems in the HTML structure (like finding unclosed DIV elements for example) by providing the extra third dimension, layering each node based on nesting in the DOM tree. Stacks of elements visually represent branches in the DOM, and each node can be inspected for the inner HTML contents, its computed CSS style and the attributes. Clicking anywhere on the visualization highlights a color-coded rectangle surrounding the corresponding node. Double click shows up the source preview for that node. Tilt also tries to show the most relevant information when needed (one is most likely to inspect the attributes of an input, button or image element, for example, but can easily switch between HTML, CSS and attributes view at any time). The “minidom” is a tree view representation showing a minimalistic snapshot of the document object model. Each node is assigned a color associated by tag name (blue for div, green for span etc.) and represented as a strip, along with visual markers for the id and/or class if available. Each one of these strips also has a width relative to the type, id and class name length for the respective element, and the corresponding 3D stack in the visualization has color-coded margins. The coloring for individual elements is easily changeable using the color picker near to the minidom legend. Clicking a strip in the tree view (or directly a stack on the 3D document visualization mesh) also highlights the node with a colored quad. This behavior is a good way to relate with the Style Inspector, and a more unified interaction between Tilt and other Developer Tools is planned in the future. All of these additions make it easier to analyze the bounds of each node, along with the HTML, computed CSS and attributes. Because Tilt is able to detect when a webpage’s DOM structure changes or when a repaint is necessary, integration is seamless with existing Developer Tools. Using Tilt and Firebug or Style Editor at the same time is easy. One can enable or disable CSS properties, changing the style of a node, and the visualization changes accordingly. 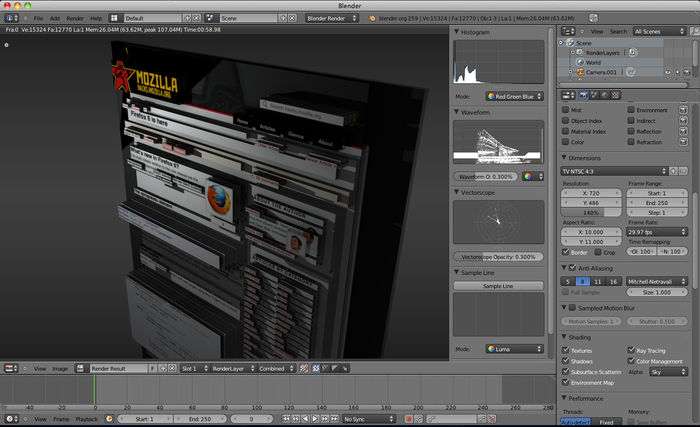 To enable realtime updates for the 3D webpage, go to the Options menu and check “Refresh visualization”. Developer tools such as “view source” have always been used to help people learn about web development. The 3D view highlights the structure of a page better than a flat view, thus anyone can immediately understand the parent-child relationship between nodes in a webpage, their positioning and how the layout is influenced. One use case for this is the Hackasaurus mashup. The X-Ray Goggles is a nice and fun tool designed to make it easier to learn about the different document node types, the “building blocks” which create a webpage. Accelerometer support was another addition based on community request. This shows how easy it is to add functionality that wasn’t originally planned. You can view the source code, fork it and also contribute to the addon with ideas or feature requests on Github, at github.com/victorporof/Tilt. The latest version of Tilt can be found on Github, but you can also download Tilt as an addon from addons.mozilla.org. For compatibility, Tilt requires WebGL capabilities. Go to get.webgl.org to check availability and troubleshoot any issues. The current version works with Firefox 6.0 to latest 10.0 Nightly releases (latest Nightly builds now also support WebGL anti-aliasing, working great with Tilt). To start Tilt, hit Control+Shift+M (or Command+Shift+M if you’re on Mac OS), or go to Web Developer -> Tilt, available in the Firefox application menu (or the Tools menu on Mac OS). You can modify this hotkey (and other properties) from the Options menu after starting Tilt. More information about Tilt, the development process and milestone updates can be found on blog.mozilla.com/tilt. Tilt has become an active Developer Tools project, and an ongoing effort is made to integrate it with other existing tools like Style Inspector and Style Editor (source code and latest builds). As the 3D view of a webpage has proven to be useful for debugging, this main functionality will gradually become part of Firefox in future releases. You always stare at walls of text without reading? Tilt is the most awesome tool I ever worked with! I mentioned this extension to some friends, WebGL developers, and they asked why it’s a Firefox extension? Couldn’t it be just a bookmarklet and therefore compatible with Chrome, Safari and Opera? One reason would be using the drawWindow() function from a canvas 2d context to texture the visualization. See more here. Fla$h video on Mozilla blog? WTF? I’d love to see this used to reveal positioned element z-index. Feasible? this is beyond incredible. the revolution will be in three dimensions! I think it is for fools. these add ons are really very cool by these developing of web pages became esay.